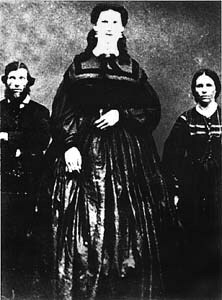 Anna Haining Bates, born Anna Haining Swan (August 6, 1846 – August 5, 1888), was a Canadian from Mill Brook, New Annan, (near present-day Tatamagouche), Colchester County, Nova Scotia, famed for her great height, believed to be 2.27 m (7' 5½") at the peak of her stature. Her parents were of average height and were Scottish immigrants. At birth Anna weighed approximately 18 pounds. Anna was the third of 13 children, all also of around average height. From birth she grew very fast. On her 4th birthday she was 4 feet 6 inches (137 cm) tall. On her 6th birthday she was measured again, and she stood 5 foot 2 inches (157 cm) tall, an inch or two (2.5–5 cm) shorter than her mother. 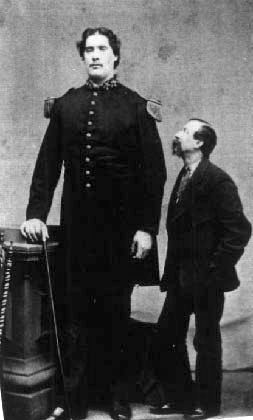 On her 10th birthday she measured at 6 feet 1 inch (1.85 m) tall (186 cm) tall. 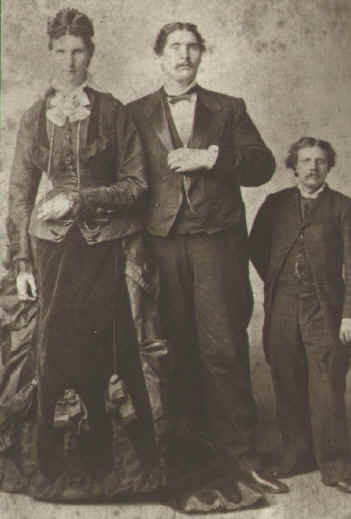 By her 15th birthday Anna Swan was measured at just over seven feet (213 cm) tall. She would reach her full height two years later, which was 7 feet 5 and a half inches tall. As part of her shows, Anna had a tape measure put around her waist and then had a lady from the audience put it around her waist. The tape would go around the average woman's waist three times. In 1869, whilst on a tour of Britain, one newspaper reporter described Anna as "Towers above all men when stood up, and most women when sat down. She has an oval face, and is softly spoken, with a gentle voice".